This entry was posted in LHC News, Science and Modern Society, The Scientific Process and tagged facts, science, Science&Society. Bookmark the permalink. Donald Trump is proof of the Uncertainty Principle in action. The more you try to pin him down the more he changes the truth. “Alternative Facts” is just a natural outgrowth and corollary. Thank you. I have posted your edifying article on my Facebook Timeline. Your comments perfectly illustrate one reason why people voted for Trump. In a mocking, sarcastic manner you looked down your long, elitist, physics nose. To Trump supporters you are a loser, most likely a sore loser who voted for Clinton. Much better if you had used your considerable talents to argue that the observations, i.e.l the two photos, were the truth. I assume you did not take either of them but even if you had you could have easily altered them in Photoshop or Gimp. Furthermore, even if photos were not altered, how does one know if they are an applies-to-apples comparison. One could have been taken with the crowd at a maximum and the other with the crowd at a minimum. If they were introduced in a trial would they be admissible evidence? Given you had not verified the photos were unaltered and each were the maximum crowd size, the phrase “Assuming the photos are…….” would be appropriate. The old adage “Truth is the first casualty of war” certainly applies to politics as well and I hypothesize most certainly to the Trump Administration. Finally I enjoyed reading your blogs on quantum physics and it is sad you stopped responding to posts. But I completely understand. Why waste your time even reading gibberish let alone the time to respond to people who would not exert the time to understand your answer. There are most certainly scientific losers in this world. I certainly understand your point of view. But the piece is a joke, and the only persons I am mocking in this piece are Spicer and Conway, who did not make a reasonable, evidence-based argument against the photographs, and said a lot of ridiculous things. I have nothing against Trump supporters; I have something against those who obscure the truth, of any political party. If anyone sees an attempt to defend the process of science and the value of evidence as an attack on the supporters of Trump, I think that’s… Sad!! And meanwhile, I no longer have time to respond to most comments. This is not by choice, but by funding. You are forgetting one thing. The idiots talking about alternate facts to the press don’t believe in science and don’t believe in the free press. 🎶 It’s beginning to look a lot like Russia 🎶. Am I ever glad I’m in Canada. If they were idiots, I’d ignore the issue. They’re not. It’s a full-on, brazen attack on the existence of reality. Even a scientist is capable of despair. Take the long view Matt. How much will today’s “facts” matter in a million years? Carry on with your quest sir. Humanity will ultimately benefit from your work. The truth has many weapons, including satire. I am certainly not in despair. Is that the extra dimensions are truth – or at least the quantum states are truth – in which we chose (wave function colapse) one ? Trump’s choose another one (more disordered or increases in entropy) – because the Nucleation (rearrangement of Informations or time forward) decides which is reality ? This implies the slight change in the constancy of heavens ? …. time forward means… more stable Nucleation ? Hi Martin. (It’s “Matt”.) You are of course right that such a post going into such details is needed. But read what I wrote, and read it carefully. 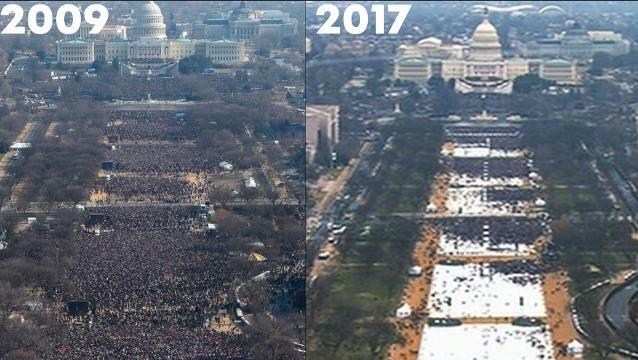 I did not, in fact, claim anything about the two photographs as far as Trump’s inauguration. I asked a simple question: “which [photo] has more people in it”, and made a joke about the answer depending on your facts. If you saw an implication in it that the photographs are sufficient evidence to prove anything about an inauguration, that was in *your* reading, not in *my* writing. I made no such claim. Thanks Matt as always for your illuminating comments! Miss you!!! I don’t agree that elitists are people who believe things should be run by experts. Elitists are people who don’t *respect* those who are not experts, and deny that non-experts have a right to an opinion. Science has nothing to do with elitism; yes, if you’re not a scientist you can’t *do* science, but the whole point of this blog is that science can be *understood by anyone*, if experts take the time to explain it to non-experts. In that sense, I view this blog as highly anti-elitist. I still want airplane pilots to fly my plane and experienced autoworkers to build my car, but I do think they shouldn’t view their jobs as something too complicated for me to understand the basics of. I appreciate your view. I’m going by the definition of “elite”: “a select part of a group that is superior to the rest in terms of ability or qualities.” I want my leaders to be superior. I want those in charge to be the best. The word “elite” might indeed be defined that way, but an “elitist” (used pejoratively) is something else. I am certainly among a scientific elite, in the sense that I have unusual training and knowledge about science. But I don’t view that as making me somehow part of a private and superior club that doesn’t deserve or require oversight by non-scientists. Again, I get your point. I was pushing back at the person who called you an elitist as a pejorative. I do not see it that way. I am glad there are experts in science, and I agree that even experts require oversight, regardless of their field. And I still want experts in charge generally. Please, I am not trying to argue with you. Let’s be done now. You are great “unnatural” Professor. You should stick to your professional field. Teaching that evidence-based science gives us access to reality, and that basic facts about the world (such as counting people in an open field) are not open to political debate, is most definitely my professional purview. You don’t have to like it, but giving me free advice is wasting your time; do you really think I’d take it? On the contrary, it encourages me. John, unless your professionial field involves giving advice to theoretical physicists about the fundamentals of science, why not apply that comment to yourself? You do realize that facts ARE a scientist’s professional field. That’s why we have things like scientific method that gives us a way to test facts objectively by having anyone, even people who disagree with us – especially people who disagree with us, check or work. What do you offer that’s better? Professor Strassler, I enjoyed your post about alternative thinking and unfortunately, it looks like we will be seeing a lot of that in the next four years. I had a couple thoughts I wanted to share. I can think of two explanations for the difference between the pictures of inauguration day crowds in 2009 and 2017 on the national mall and the perceptions of one 47percenter. (1) There are actually a LOT of people in the 2017 picture, but you just can’t see them. Either (a) they are all wearing white hats, white coats, white pants and/or white dresses and you just can’t see them against what appears to be mostly empty areas covered in white tarp or (b) they are very very small people, perhaps homunculi, and just don’t show up in pictures taken from that distance. (2) There were people there, but they spontaneously fluctuated into invisible particles. If they became gravitons, perhaps that might further explain why we seem to see small clusters of people gathered toward the Capitol. These might be very dense clusters of people, perhaps on the order of neutron stars. You mentioned that you felt our borders should be safe from invasion as the laws of science and physics hold sway here (making us safe from invasion of flying carpet soldiers), but perhaps not elsewhere. I sense this about to change. In my very own state of North Carolina, climate change does not exist. The state legislature forbade studies of sea level rises from extending beyond a certain time limit (so as to keep the barrier islands from disappearing?) I suspect this type of “vision” and ostrich thinking may go nationwide. It seems that you are either with us or against us and to have any criticism must be counter argued; there is no neutral. To challenge one view is to imply you take the other view and you are presented with an alternative fact. With so much media coverage, live recordings, time lapse videos, it can all be ignored because the CNN Gigapixel image at it’s most zoomed out doesn’t appear to show the emptiness. The power of cognitive dissonance! There are no alternative facts, only alternative universes. And that’s a fact! There are many alternative theories. Progress in science requires throwing out the wrong ones. That would be impossible if there weren’t facts beyond dispute; you can’t tell if a theory’s wrong unless you can show that its predictions are in contradiction to facts. And the success of science in serving as the foundation for technology we use every day is post facto proof that facts do, in fact, exist. That doesn’t mean they’re simple, or that they can’t be interpreted in multiple ways, especially if you’re trying to obscure their meaning. But they do exist. 🙂 Also, I think it’s important to understand that string theory’s prediction of a multiverse, with its different laws of particle physics in different patches of a large multiconnected universe, is STILL governed by one law of nature: the equations of string theory. Those don’t change from place to place; just their manifestation in terms of particles and local spacetime change. As a Canadian I am very worried to see Trump as President, and I agree that it is important that people take position and opposition on any none sense. Are you still planning to publish a book on particles physics? I certainly prefer when you write about particle physics. Common people tend to be less rigorous about using their language than scientists, I think there’s not much point to be so upset about it now – it’s been happening for years if you didn’t notice. I have also heard that scientists examine things from different points of view before they get to conclusions. Altering native facts, isn’t that what national politics is all about? Imho flying carpets are much superior to cars!! I wonder if our “post-fact” world might not have some roots in the tactics of marketing, sales, and commercials. To sell products (which we often don’t want or need), they manufacture this weird alternate reality that seems like our reality, but which is twisted off-kilter to their own ends. And politics has always been the realm of the unreal. To be fair I think what they meant to say was ‘(alternate) estimations’; gauging crowd numbers is not a precise science, just look at our estimates for the ‘million man march’. Even photographic comparisons like that can be misleading (Taken at different times of day or event say or when people are elsewhere.) One could argue that the estimates given by the media were biased and that some alternatives might give a better overview of the situation. One could even argue that doing so would be good science.. However in that particular case most reliable estimates differ so greatly that there is no credible argument to be made that the 2017 crowd was larger. The treatment of the issue however I find illustrative in terms of bias and how the public deals with it. i once read a book on ‘truthiness’, endorsed by Bush. I can’t recall the title, but it was a very small book that dealt heavily in circular logic trying to assert that subjective truth is absolute truth is subjective. If you read the book in a semi- conscious state you might (or might not) perk up at the blatant contradictions (thankfully, it was poorly written).